On our way to dinner at Richie's Diner the other night, we found 5 classic Fords in the parking lot. This image and the one from yesterday, are just a two of many I took. I love cars. 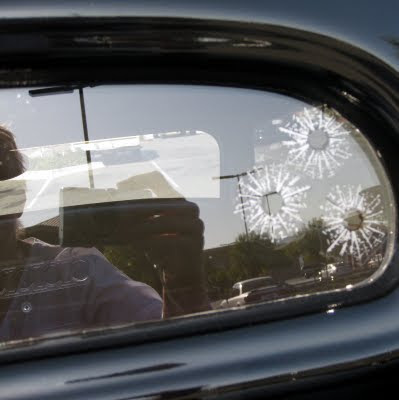 I've seen these fake bullet holes before, and they really DO look real. Some of the ones that go on the car bodies even have rust around them. Just not something I would have thought of putting on my car! We have been to a couple of car cruises at Richies! I love the reflections in both these photos. We have a 48 Chevy sedan delivery and I actually offered to sell MY Bob at the Corona farmers Market this morning! Great shots of the old cars!